The Royals have a number of position-playing prospects who project to be solid Major Leaguers, but at this point it's hard to imagine anybody in the system contending for an MVP award in the bigs. Nick Pratto, a teenaged first baseman with an advanced approach, could prove an exception as his body develops over the next few seasons. Khalil Lee and Seuly Matias give the organization a couple of young, athletic outfielders. Hunter Dozier, who missed almost all of 2017 with two different injuries, has nice power. Catcher Chase Vallot posted a .380 on-base percentage in the Class A Advanced Carolina League last year. Not so long ago, it looked as though a day would never come when the Cubs wouldn't have several of the Minors' most promising hitters on the brink. But after a series of graduations (including most of Chicago's projected starting lineup) and a few high-profile trades (so long, Gleyber Torres and Eloy Jimenez), here we are. Aramis Ademan, a left-handed hitting shortstop, made his stateside debut at age 18 and after six weeks in short-season ball, played well in the Class A Midwest League. Victor Caratini is ready to back up catcher Willson Contreras in the big leagues. Speedy outfielder Charcer Burks got on base at a .370 clip in the Southern League last year. Kyle Lewis could be one of the most exciting players in the Minors, but the guy can't catch a break so far. A few weeks after he was drafted, he badly injured his right knee and has been dealing with the repercussions of that -- including surgery -- since. Last week, it was revealed he recently underwent a scope that will sideline him for four to six weeks. Last year, the Mariners added Evan White -- a decent hitter and very good defensive first baseman -- with the 17th overall pick in the Draft. Third baseman Joe Rizzo, who turns 20 next month, had a strong 2017 and was named the California League Finals MVP after arriving on the circuit for just five regular-season games. Julio Rodriguez, 17, is toolsy but hasn't played a pro game yet. Braden Bishop, once considered a prospect primarily because of his defense in center field, handled himself very well at the dish last year. Pavin Smith, the seventh overall pick of last year's Draft, had 15 doubles and two triples while posting a .401 on-base percentage across 51 games in the Class A Short Season Northwest League in his debut season. The slugging first baseman ranks No. 91 among MLB.com's top prospects, and if he begins to drive the ball out of the yard in his first full campaign, look for him to climb higher. Arizona's next two picks brought in another couple of heavy hitters -- corner infielder Drew Ellis and catcher Daulton Varsho. Infielder Ildemaro Vargas had a spectacular year with Triple-A Reno and teammate Christian Walker was the Pacific Coast League MVP. At the lower levels, shortstop Jasrado Chisholm and outfielder Marcus Wilson look promising. Middle infielder Domingo Leyba, acquired from the Tigers in the three-way deal that sent Didi Gregorius to the Yankees, missed the bulk of 2017 with shoulder problems. The Tigers have four prospects among MLB.com's Top 100 -- a strong showing -- but they're all pitchers. That's not to say there aren't position players to get excited about. Outfielder Daz Cameron and catcher Jake Rogers came aboard (along with No. 39 overall prospect Franklin Perez) in the Aug. 31 deal that sent Justin Verlander to Houston. It's a compelling duo. The latter, son of former All-Star Mike Cameron, is as well-rounded as they come. He impressed in center field while collecting 51 extra-base hits and 32 steals last year. Rogers is a wonder behind the plate and has substantial pop at it. There's also Christin Stewart -- who's hit 58 homers over his last 264 Minor League games -- and Derek Hill -- who makes Willie Mays-like plays in the outfield but was held back by quad issues in 2015 and a torn ulnar collateral ligament in 2016. Amed Rosario and Dominic Smith are no longer prospects, leaving the Mets with no prospects in the Top 100. Still, 19-year-old infielder Andres Gimenez gives them another exciting young shortstop. The native of Venezuela played well over 92 games in the Class A South Atlantic League last year, and his makeup draws praise. There's plenty to like in Peter Alonso's bat, and third baseman Mark Vientos made a quick and promising adjustment to pro ball after coming aboard as a second-round pick. Athletic Desmond Lindsay has progressed slowly through the Minors because of injuries, but he remains a strong prospect. Smooth-fielding Luis Guillorme put himself on the brink with an impressive showing for Double-A Binghamton. Heliot Ramos has power, speed and strong defensive skills in the outfield, and he torched his first crack at pro ball -- 35 games in the Rookie-level Arizona League as a 17-year-old first rounder. He rates as the No. 63 overall prospect, and he's the only San Francisco player currently on that list. Aramis Garcia's defense behind the plate has improved, and he hit 17 dingers in 81 Cal League games last year. First baseman Chris Shaw and outfielders Austin Slater and Steven Duggar are closer to the Majors -- Slater having seen some big league time in 2017. All three are interesting, with Shaw boasting significant pop and the other two more toolsy. Like the Cubs, the Red Sox have graduated a lot of talent from an incredibly stocked system and traded other pieces for big league contributors in recent years. Unlike Chicago, Boston still has No. 79 overall prospect Michael Chavis working his way up and a few other promising youngsters. Chavis, the 22-year-old third baseman is in big league camp after belting 31 homers between Class A Advanced Salem and Double-A Portland and socking four more dingers over 23 Arizona Fall League games. Another corner infielder, Sam Travis, put up a .325 OBP with six doubles over his first 33 big league games last year. C.J. Chatham is a shortstop with a strong arm and a nice hit tool. Outfielder Cole Brannen, a second-rounder in 2017, has speed that rates a 70 on the 20-80 scouting scale. First baseman Josh Ockimey and third baseman Bobby Dalbec have shown the ability to get on and also drive the ball. Carson Kelly (No. 46) is one of only two backstops to crack the top half of the Top 100 rankings. Drafted out of high school in 2012's second round, the 23-year-old is still improving behind the plate, but overall, seems strong and well-rounded. Bopper Tyler O'Neill, acquired for Marco Gonzales in July, had a slow start in the Pacific Coast League last year, but still finished with 31 homers and a .321 OBP. His power will play anywhere. Considering he's still 22, it's not totally out of the question that he'll make strides in striking out less and walking more. Doing so could make him a superstar. Fellow outfielder Harrison Bader is close to a complete player and should be better than he looked in 32 Major League games last year. Cuban defector Adolis Garcia looked electric in his first season of affiliated ball. There's a bit of quality depth here. 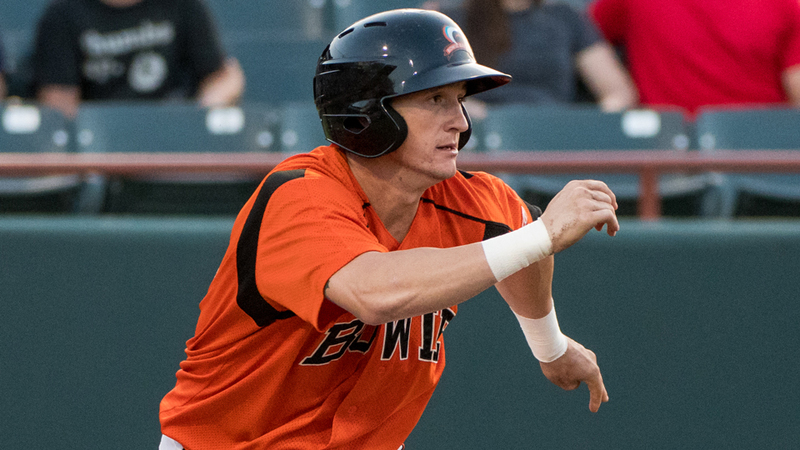 Outfielder Austin Hays couldn't have had a better first full season, batting .329/.365/.593 with 32 homers over 128 games split evenly between Class A Advanced Frederick and Double-A Bowie, and he got into the bigs for 20 games too. That showing launched him from No. 89 to No. 23 among the Top 100 Prospects. Ryan Mountcastle cracked the list too, landing at No. 98. He moved from shortstop to third base following a July bump from Frederick to Bowie, but it's his offense that makes him especially intriguing. The 2015 first-rounder tallied 18 homers and 48 doubles last year. Chance Sisco remains one of the best catching prospects in the game. Outfielders Cedric Mullins, Anthony Santander and D.J. Stewart bear watching.